This new journey leads to the border triangle Germany, France, Switzerland. A look at the weather map or advertising promises a spot of earth "spoiled by the sun". The climatic conditions have created a diverse flora and fauna and a well-known wine region. In addition, this gem in the Upper Rhine plain, picturesquely situated between the Black Forest and the Vosges Mountains, offers many cultural and art historical highlights in Freiburg, Colmar and Basel. The beautiful landscapes at Tuniberg and Kaiserstuhl invite you to hike and linger. In addition to the guided program points, there is also the opportunity to explore cities and regions on your own or simply relax and unwind. Day 1: Welcome to the tri-border region! Flight to Zurich. Drive to Freiburg. Day 2: Prelude to the "most beautiful tower of Christendom"
The first day of our journey takes us to Freiburg, the cathedral, famous for its unique tower. Inside we can expect a large number of medieval works of art, including the famous high altar of Baldung Grien. After an impressive tour of the city and Münster, there is still time for your own city exploration. In the afternoon drive to St. Peter in the Black Forest with a visit to the famous monastery of the architect Peter Thumb. After a panoramic drive through the picturesque Glottertal (location of the "Schwarzwaldklinik") return to the hotel. Today we are on the beautiful Kaiserstuhl on the way. In Niederrotweil we stop at the church of St. Michael: The main attraction is the carved high altar by Hans Loy. Continue to Breisach to the "Stephansmünster": Here, too, Hans Loy created a high altar, which is one of the most important monuments of German carving. The west wall is painted with a fresco by Martin Schongauer. Through the picturesque vineyards of the Kaiserstuhl we drive to Endingen: the historic old town with its romantic corners and squares invites you to linger at midday. After lunch break and free time we set off for the last sightseeing point of the day, the Roman Mithras shrine in Riegel. We start the day with a short hike (optional bus ride) through the vineyards of the Tuniberg: Unique views in the Black Forest, Vosges and Kaiserstuhl make your mind and soul good. Then we get to know the good wines of the region during an exclusive wine tasting with Baden Vespers in the Kaiserstuhl. Optionally, you can design this day according to your preferences and use all day for recreation. Today we are visiting our French neighbors. We spend the morning in Colmar: After visiting the famous Isenheim altar by Matthias Grünewald, there is free time. Continue to Eguisheim (birthplace of Pope Leo IX) with its idyllic lanes, houses and magnificent flower arrangements. Via the "Alsatian Wine Route" our journey continues to Thann to the Minster - beside Strasbourg, Freiburg and Basel one of the main and masterpieces of Gothic construction and equipment on the Upper Rhine. Then drive through the Vosges with dinner in a Ferme Auberge. From there we enjoy a magnificent view of the Upper Rhine plain and the Black Forest. 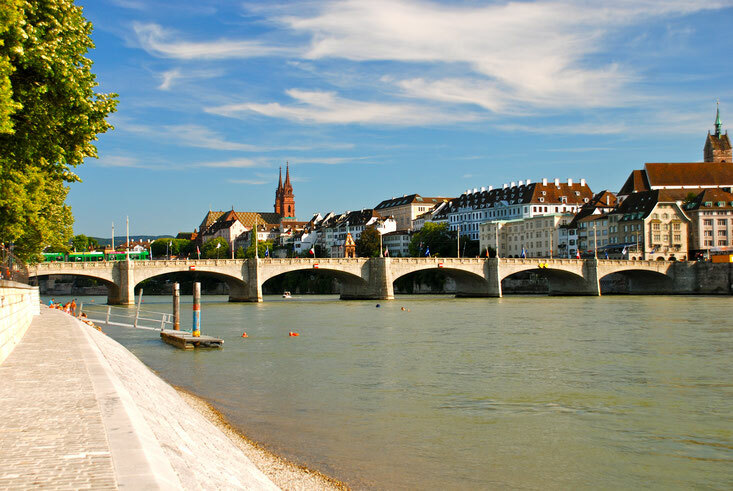 A trip to Switzerland takes us to Basel: the short crossing with the Rhine ferry offers us a particularly beautiful view of the Basel Minster, which we then visit. After a walk through the old town you have free time. On the way back we make a stop in the "Fondation Beyeler": this world-famous museum of modern and contemporary art is the most visited museum in Switzerland. Our way leads us once again in the old part of town to Freiburg: After a walk over the famous and beautiful Münstermarkt we enjoy in the cathedral the "organ music at the market time". Following free time. Optionally, visit the Augustinermuseum with its renowned art collection from the Middle Ages to the Baroque as well as 19th century painting. After a scenic drive through the Hexental we reach the baroque church of St. Ulrich, built by Peter Thumb. The day ends with a dinner in a typical country inn with Baden specialties.